VME3 Series unibody economy ball valves are a great choice for lower pressure general hydraulic and petroleum shut-off needs. 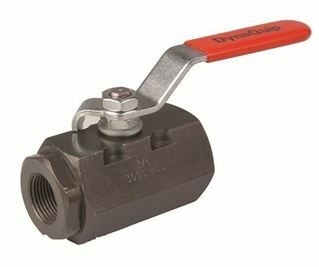 Valves are unibody bar stock construction with phosphate-coated bodies and NPT threaded connections in a reduced port design. Built strong and designed to last longer than lightweight imports. VME1 Series 2-piece ball valves are a great choice for lower to medium pressure general hydraulic and petroleum shut-off needs. 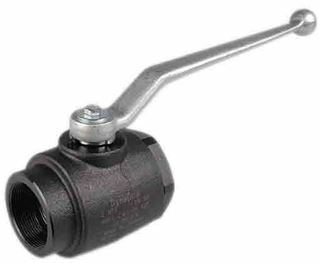 Valves are two-piece bar stock construction with corrosion-resistant phosphate coated bodies and NPT threaded connections in full and standard port design. Built strong and designed to last longer than lightweight imports. VLE2 Series 2-piece medium ball valves are the perfect choice for intermediate pressure hydraulic and industrial applications. 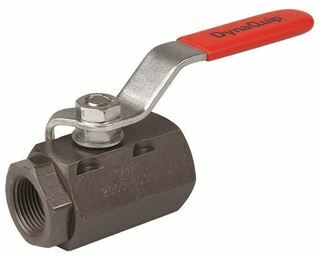 Valves are heavy-duty two-piece bar stock construction with phosphate coated bodies and NPT threaded or SAE O-Ring Boss connections in a full port design. Strong and durable. VAE2 Series ball valves are designed for high-pressure hydraulic applications. Bar stock design (1/4” - 1”), cast steel bodies (1 1/4” - 2”). 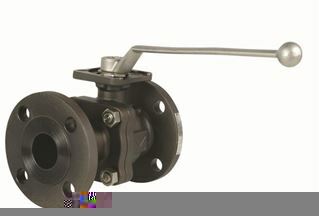 This full port valve is available in NPT threaded or SAE O-Ring Boss end connections. 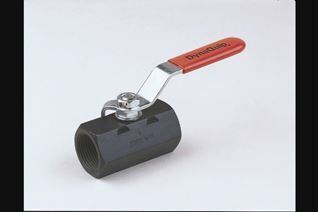 Valves feature Delrin® seats, blowout-proof stems, and cast steel handles. 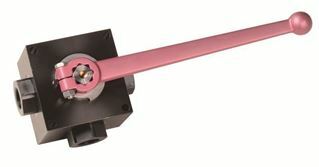 Operating temperature range: -20° to 175°F. V6C Series ball valves are designed for hydraulic, petroleum, and general chemical applications where maintenance is key! These three-piece bolted in-line valves feature investment cast steel bodies and end caps for durability. Avail in NPT threaded for socket weld end connections. 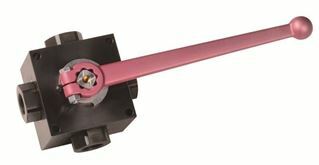 Valves feature carbon-filled TFM seats, blowout-proof stems, and actuator mounting pad. This valve can be automated, please inquire. 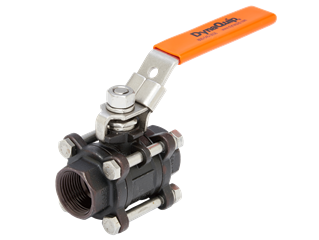 VZE Series ball valves divert flow from one incoming port to two different ports in an L-port design. Self-lubricating Delrin® seats. Uses include hydraulic oils, water/oil emulsion, air, glycol and gasoline. Not rated for steam or vacuum applications. Max pressures 4568 to 7250 psi CWP (size specific). VXE Series multi-port ball valves are diverter valves with 4-way Double L-Port (two-position) for controlling a hydraulic cylinder.. Self-lubricating Delrin® seats. Uses include hydraulic oils, water/oil emulsion, air, glycol and gasoline. Not rated for steam or vacuum applications. VHC Series Flanged Ball Valves are perfect for a wide range of applications where an ANSI 150 flange ins needed. This two piece A216-WCB investment cast body valve features a low-out proof stem, anti-static device, and a fire safe design (test to API 607). This valve can be automated – see our DynaMatic PHC and EHC series. RFTE Seat, PTFE Seal and Packing.